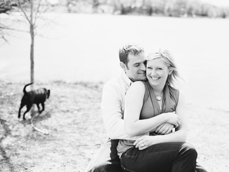 Earlier this Spring, Tom, Kristen and I went out for a sort of encore engagement session. Our first engagement session happened last winter when we did something in studio. But Tom and Kristen have a special place in their hearts for these pups and they wanted to include them in another session. Cedar Lake provided a great backdrop where we could let our hair down and go sans leash. Thank goodness it has warmed up since these photos were taken! Looking forward to seeing you soon Tom and Kristen.